Starting up as a contractor is an exciting, but often confusing time. It’s therefore important that you identify the key issues that should be considered from the outset and deal with them appropriately, to ensure your contracting experience is enjoyable and hassle free. Here, you’ll find tips and advice on starting up on your own. But, before you make any decisions, it’s important to talk to a professional adviser who understands the issues faced by contractors. The right specialist contractor accountant will be able to answer your questions and tell you so much more about the questions you may not yet know to ask. They will be able to set up your company for you and help you to avoid any nasty surprises further down the line. Unlike permanent employment, as a contractor you will effectively be your own boss – free, to a large extent, to decide when and where to work. Before you make the decision to go it alone, it’s important you ask yourself some tough questions, to help you establish whether contracting is, in fact, the right move for you. Are you disciplined enough to work hard at making a success of your career as a contractor? Do you know your own strengths and your limitations, so that you don’t oversell yourself? 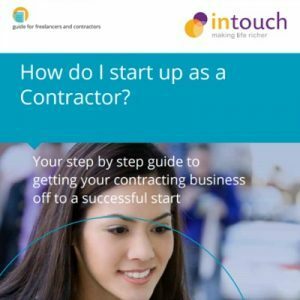 Once you’ve answered these questions and you feel confident that contracting is the right choice for you, you can then start to get your new business wheels in motion. Starting up as a contractor involves a number of important steps, to make sure you get things right first time. Once you’ve chosen the right specialist contractor accountant, they will be able to advise you on how best to start up as a contractor and guide you through the set up process. Decide on your contractor trading structure – should you be a limited company, use an “Umbrella”, or trade as a sole trader/partnership? How long you intend to be contracting for? What are the terms in the contract with the customer? How long will the contract be for? Is the contract full or part time? What are you likely to do after this contract ends? How disciplined are you at doing administration? Is the contract likely to expose you to commercial risks? Increasingly, the most popular and, generally, the most tax efficient contractor trading model is the limited company option. This does, however, require a commitment to the lifestyle of being a contractor, but it offers the rewards of freedom, flexibility and control over your career path. Below, you will find more information about limited companies, Umbrellas, sole traders and partnerships. Speak to your specialist contractor accountant who will advise on the best company structure for you – they will also manage the company formation on your behalf. Whichever route you choose though, it is important that you maintain discipline and comply with the legislation relevant to running a business. If you want to run your own business that has its own legal identity and can earn profits and pay taxes in its own right, then having your own limited company could be right for you. For contractors with an annual income of more than £40,000, this trading model is often the most tax efficient option. What does it mean to be ‘limited’? Being ‘limited’ effectively means that your business’ finances are separate from your own personal money and, if you run into difficulty, you will only lose money from the business. There is no claim against your personal assets. As a shareholder (owner) and director (employee) you will be responsible for the operation and control of your company, its bookkeeping, preparation of tax returns and filing of information, and ensuring you understand your risks under IR35 and other legislation. You will need to arrange appropriate insurances and protect the assets of the business. Paying yourself a salary or bonus as a director (employee). Trading as a limited company is normally more beneficial for contractors in the vast majority of instances, and implies more permanence than choosing the Umbrella route. As a new contractor, set up issues can appear daunting, so speak to your specialist contractor accountant who will discuss your needs with you at the outset and review your contract for IR35 compliance. Umbrella companies – less admin, more tax? Working under an Umbrella arrangement is most suitable to contractors who do not wish to be burdened with the administrative hassle of being self-employed normally when they first leave permanent employment. Umbrellas are also popular with contractors who are only in it for the short term, or those where their contracting income is unlikely to exceed £40,000 per annum. Contractors who move between being independent and permanently employed, use Umbrella organisations to dip in and dip out of the contracting market with ease. They pay taxes as employees (“Permies”) with the exception that they can achieve some limited benefit by claiming tax relief on business expenses they incur. Umbrella workers are employed by the Umbrella company which deals with the ultimate customer. The Umbrella entity performs all of the necessary administration that would otherwise fall to the contractor, in return for a fixed fee or a percentage of the fees charged to the client. As a contractor employed under an Umbrella arrangement for tax purposes, you are treated very similar to a permanent worker. While this is dependent upon your contract with the ultimate customer, after deduction of PAYE and NIC, your take home salary can be increased, because legitimate business expenses are taken off your income, before the tax due is calculated. This is normally done for you by the Umbrella company. To learn more about choosing an Umbrella, or to find out if this is the best company structure for you, speak to your specialist contractor accountant. Sole trader/partnership – benefit vs. risk? Working as a sole trader has many of the freedoms of operating a limited company, but with less of the formality. But, as with being limited, a sole trader is still responsible for the maintenance of accounting records, the production of an income statement, collection of fees, professional indemnity insurance and payment of taxation. Agencies continue to strongly prefer contractors to use limited companies or agencies. Some agencies will not deal with sole traders, due to a perceived risk of the agency becoming liable for sole traders’ tax liabilities, should the contractor not pay them. Whilst the risk of being liable for the unpaid tax of others may be overly pessimistic, in this case the concerns of the agencies are real and do have commercial weight. What does it mean to be a ‘sole trader’? A sole trader is, in effect, self-employed. The income you generate though the business will be counted alongside your personal income, making the accountancy side of running a business relatively straightforward. But, unlike a limited company, as your business and personal finances are combined, if you run into trouble, you are solely responsible financially. A sole trader has no separate legal identity from the individual and no registration is required, other than to inform HM Revenue & Customs (HMRC) of its existence. But, individual sole traders do not have the same protections as a limited liability company; therefore the requirement for professional indemnity insurance is even clearer. Further, remember that, because of the potential employment risks involved, agencies may be unwilling to find contracts for sole traders. Any income of a sole trader is assessed on the individual in the tax year in which it is earned. Income is taxed at income tax rates in force at that time. If the same level of fees is earned by a contractor using a limited company, the ability to have some of the income taxed under income tax rates, and some under corporation tax rates, results in lower amounts of tax overall. Partnerships are extensions of sole traders. More than one consultant will group together, forming a partnership, to find contracts, share skills and resources. The nature of the business arrangements for sharing costs and profits are normally explained in a partnership agreement. For taxation purposes each partner will be taxed on their individual share of the income, as set out in the partnership agreement, as if they were sole traders. VAT – Should you be registered? What type of contracting will I be doing? How much income will the business generate over 12 months? Am I likely to be purchasing many services and items that attract VAT? Will all the services be provided in the UK, and to whom will I invoice the work? Will the services I provide be VATable? Does the Agency/client require you to be VAT registered? VAT is charged at the current standard rate of 20% on almost all products and services provided in the UK. If you are running a business and expect to turnover £81,000 or more over the next 12 months, then you must register for VAT*. However, if your turnover has gone over the registration threshold temporarily, then you may be able to apply for an exception. Almost all limited company contractors voluntarily register for VAT, irrespective of turnover, as it looks more professional to submit a VAT invoice, and there are also other benefits to be had from registering. HMRC operates a number of VAT schemes, but flat rate scheme (“FRS”) VAT is by far the most common option for contractors, as it enables you to simply apply a flat rate VAT percentage to your turnover, thereby cutting down on the time spent on accounting. It’s very simple to operate and is ideal for most contractors. On average it takes about 2 weeks to establish a VAT registration under the flat rate scheme rules. Depending on the type/nature of consulting work you perform, if you are registered for VAT under FRS, then a government issued percentage is applied to your gross turnover (say 14.5% as the most frequent example) and that is the amount you pay to HMRC. If the difference between these rates is more than the VAT you have suffered on costs, then you have made a profit from being registered. Because most contractors incur limited amounts of VAT on costs, they do indeed benefit from this treatment. If the actual VAT suffered in the year was £1,125 then the real gain is reduced to £825. In order to be better off under the standard VAT scheme you would need to incur VAT inclusive costs of over £1,000 a month. Speak to your specialist contractor accountant who will provide you with further details. They will also be able to register you for VAT and help you complete a quarterly VAT return. IR35 – what is it and how does it affect you? IR35’s scope does extend to cover all contractors! Because it’s subjective, and the legislation does not contain many definitions, you can’t ever be 100% IR35 compliant. IR35 affects individuals who are deemed to not be fully self-employed, but are ‘disguised employees’ – contractors who are treated and act as permanent staff. IR35 prevents these individuals from benefiting from the tax advantages that trading through a limited company can bring. Have I worked with, or for them before? How did I find the work and is there a formal agreement in place? Do I anticipate having other projects at the same time? The legislation works on a contract by contract basis, so one contract being determined as falling within the scope of IR35 legislation, does not mean that all future work will necessarily be treated in the same way. Numerous factors need to be considered in order for each contract to be assessed. – involving your spouse in your new business? Section 626 is also known as the ‘husband and wife tax’. The rules were introduced to stop family members passing money and assets between themselves, on the basis that they would then take it back. But, what happens when a husband and wife setup a business together – both carry out work for the company and they therefore share the income? Or what if you have a limited company through which you carry out work and a family member, who doesn’t earn income for the company, but assists with the day to day administration, owns shares in the company? Will you be caught by S626? If you are a husband and wife team, make sure you don’t end up getting caught out by the taxman. Speak to your specialist contractor accountant who will advise you on issues relating to S626 and deal with HMRC enquiries on your behalf. At Intouch Accounting, we only deal with contractors and freelancers. We’re therefore not trying to be a one size fits all for any type of business. We know what it means to be a contractor, because we work with contractors all day, making it possible for them to enjoy the freedom of freelancing and contracting – and helping them to increase their take home pay! We know that starting up as a contractor can be overwhelming at times. That’s why we’ve set up a personal adviser for people just like you – supporting those new to contracting to navigate the many choices, and providing advice on the best possible solutions to help you onto a strong footing, right from the start. At Intouch Accounting, we provide a personal online accounting service, advising on all accounting and tax issues affecting UK based contractors or freelancers who provide their services using their own limited company. We also have experience in advising non-UK based contractors and consultants. And we provide all this for an amazing value monthly fee. Are regulated by the Institute of Chartered Accountants in England and Wales (ICAEW) and Freelancer and Contractor Services Association (FCSA), giving you peace of mind and extra reassurance of thehigh level quality service we provide to all our clients. It’s not just what we can do for you, as a contractor or freelancer; It’s also how we do it that makes the difference.